And of course, you’re not limited to when you serve this New England Clam Chowder. It’s great at a party; it’s rich, you can get by with serving in smaller bowls or cups if it’s part of a larger spread (although you might want to double or more if you have a crowd) and it’s great on a cold fall or winter day for the family. Ya can’t go wrong – unless you don’t make it. Chowder is traditionally known as a “soup or stew of seafood (usually clams or fish) usually made with milk or tomatoes, salt pork, onions, and other vegetables (such as potatoes) also : a soup resembling chowder//corn chowder”, according to Merriam Webster dictionary. There’s no denying that over the years we’ve gotten more sophisticated and so have our expectations, and that applies to what we eat as well as everything else. It applies to how we think about Chowders, too. These days, we’re looking for great flavor, mouthfeel, and appearance. This New England Clam Chowder delivers on all counts. I think this New England Clam Chowder is going to fit the bill no matter how you like your clam chowder. It can be as thin or as thick as you’d like it (over the years, thicker chowders are becoming more and more the trend) and can be made with fresh, frozen or canned clams. That means no matter where you live, this gorgeous Clam Chowder is within your reach. Serve your Chowder garnished with bacon, and a wonderful accompaniment is my Old Bay Oyster Crackers. They’re crunchy little bits of deliciousness and nothing goes better with any fish or seafood that a little Old Bay and some Oyster Crackers. Combined…amazing! 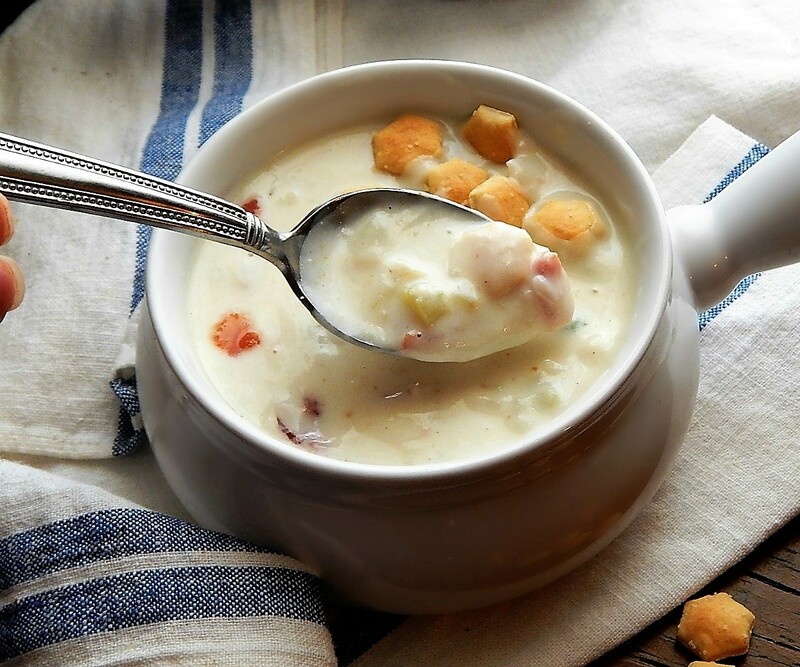 This particular New England Clam Chowder isn’t just a soup or stew with a little milk in it, which hearkens back to the earliest New England Chowders (Manhatten Clam Chowder is the kind with the tomatoes in it) it’s so much more. It’s a chowder for today. The method used is a little different from some Chowders and gives you a gorgeous, silky texture that doesn’t separate, and it also gives you a bit of control as to how thick or thin you’d like your chowder to be. The chowder starts out like most, using a bit of rendered bacon instead of salt pork to saute the onions and celery, which is a common substitution these days. And while most chowders add stock and cook the potatoes, and then add milk or cream, this recipe stops at the potatoes and takes a departure. A roux, a mixture of flour and butter is cooked together in a separate pan, half and half is added and the mixture cooked together, then that mixture is added to the Chowder, thickening it beautifully. At that point, you can add more stock, more clam broth milk, half or half or cream to reach your absolute perfect consistency. Whatever floats your boat. As a matter of fact, if you use half milk and half cream rather than buying actual “half and half” you’ll have both milk and cream at your disposal to add to the final chowder. Directions for using fresh, frozen or canned clams are in the recipe. If you use canned, especially, add in at the end and make sure to not cook them so long they become rubbery. First of all, there’s no doubt that buying canned clams is going to be the cheapest option in most areas of the country, maybe even in New England or other coastal areas. If you’re on a budget you’ll want to balance taste (and texture) against cost which varies with location and seasonality and make your decision. Even in the Midwest, we can pick up little bottles of clam juice or broth, which I consider to be optional, especially depending on the clams you use. As far as the dairy, generally using half cream if it’s at a great price (like Aldi or Costco or on a holiday sale) might be cheaper than buying 1/2 and 1/2. If the price of 8 ounces of cream plus 9 cents is less than the cost of 16 ounces (a pint) of 1/2 and 1/2, the milk/cream combo is less expensive. Bacon is an item that takes up little room and keeps in the fridge for a good amount of time and freezes well. Pick it up at a low and stock up. Bacon is generally on sale prior to almost every holiday, especially Holidays were brunch is served like Easter and Mother’s day. There’s no reason to ever pay full price. Note: 1/2 and 1/2 is just half cream and half milk. You can buy 1/2 and 1/2 and use it as is or you can use any combination of milk and cream you’d like. 2 cans (6-1/2 ounces each) of whole clams, chopped into chunky pieces, drained, or an equivalent amount of frozen, cooked clams. See note for fresh. Add bacon to cold Dutch oven and turn the heat to medium-low. Cook, stirring until nearly crispy. Remove bacon to a plate and reserve, leaving the drippings behind in the pot. Add the celery and onion to the drippings and cook for several minutes, using a spatula to rub up and residue on the bottom of the pan left behind from the bacon. Add potatoes, water or broth, and clam juice, along with the white pepper, salt, and thyme to the Dutch oven. Cover and cook at a simmer for about 15 minutes, or just until the potatoes are tender. In the meantime, melt butter in a medium-sized saucepan. Add flour and stir until thickened. Cook, whisking, until the mixture begins to look dry but not so long it takes on any color. Turn the heat down just a little and add the half and half, a little at a time, whisking vigorously until smooth. Cook, whisking, until thickened so that when a finger is run across the back of a spoon dipped in the mixture, it leaves a distinct line. When the potatoes are tender, turn heat down to a bare simmer and add the roux a little at a time to the Dutch oven, whisking after each addition. The easiest way to do this is to pick up the roux in the tines of the whisk. Do not boil the chowder again at this point. Add the clams and half the bacon to just heat through, a minute or two. Add additional milk, 1/2 & 1/2 or broth to thin to desired consistency. Garnish, if desired, with parsley, chives and/or green onion along with reserved bacon. Serve with oyster crackers. If there is any leftover, chowder will thicken in the refrigerator. Slowly reheat and then add a little more liquid if needed. If you’d like to use fresh clams in your chowder, use 4 to 6 pounds fresh clams, your preferred variety, and use the broth from cooking instead of the bottled clam juice and the chicken or vegetable broth. Bring clams and 4 cups water to a boil in a large pot over high heat. Cook until clams open, 8-10 minutes, and discard any that don’t open. Strain clams from broth, reserving broth. Let clams cool slightly, then pull meat from shells and dice. Measure 3 cups of the broth and use instead of the bottled broth and stock. Reserve any remaining stock in case the chowder needs to be thinned. This entry was posted in Click here for Bargain Meals, Click here for Fabulous Food Posts and tagged Bacon, Boston, Chicken Stock, chowder, clams, crackers, Cream, Half & Half, milk, New England, Potatoes, Soup. Bookmark the permalink. SOO MANY WAYS TO DO THIS! 🙂 GREAT POST! LOVE THE STUFF. Adore thick clam chowders like this, it’s a frequent lunch choice when eating out here on the coast. This looks delicious. You know I never liked seafood until I had it on the coasts = lobster and scallops on the east coast, but what I remember most about California was this dish of shark I had. That was back in the 80’s and I still remember it! Interesting, I haven’t seen shark in the market for eons. I love a good seafood chowdah. I grew up on the canned clam version and have made a bunch of others, but never clam. I need to change that ASAP!!! I do love any chowder!! It’ like comfort food for me, second only to mashed potatoes, lol! I will check this into my rotation sometime. THANX 4 SHARING!! Thank you for stopping by and commenting! Hope you guys love it! Yum! Adding to today’s grocery list..
It’s good! 🙂 I hope you like it as much as we did! Thanks so much. I have a couple potato soups on my blog already, but I might just use more potatoes and leave the clams out. It’s that good!! Yum! So delicious on a cold day. Hugs. This is a perfect soup for this time of year! I love the consistency of yours. I don’t like a watery chowder. I don’t like them watery, either. Especially when the butter or bacon grease kind of floats to the top and sits there. Ugh!! I think you’d like this one a lot, then!